And Hope In An American City. New York: One World, 2018. Dr. Mona Hanna-Attisha, a fiery, fiercely focused, determined pediatrician, tells of her battle against government officials when she learned that the entire city of Flint, Michigan, was being poisoned. The Detroit water company’s clean water from Lake Huron had been switched to the Flint River—without consideration for necessary anti-corrosion treatments; consequently, the corrosive water caused large amounts of lead to break off from the city’s pipes and into the city’s homes and buildings. The citizens were being poisoned by a known toxin. Knowing that children, ages 0-5 were most susceptible to long –term damage, “Dr. Mona” focused her rushed research project upon that age group. But her concern was for all of Flint, a depressed, bankrupt city, which had a predominantly minority population. She makes no effort to hide her scorn and frustration with the local, state, and federal establishment: “…[leaders] have to be held accountable, have to be challenged because power corrupts, and our moral sensibility can be so dulled that we let atrocities happen right around us, unless we manage to stay constantly vigilant, sensitive, aroused, and ready to take a stand.” While other scientists had tried to attack the problem, Dr. Mona obsessively fought—her passion and urgency coming from her “family’s sense of loss and dislocation”; they were Iraqi immigrants. Flint’s bankruptcy had led to Governor Rick Snyder’s removing the mayor from power and establishing an Emergency Manager, whose main objective appeared to have been tightening the spending. Switching the water source from the Detroit company’s Lake Huron pipeline to the Flint River would yield major savings. But the result was dirty , smelly water that required filters in the homes—filters that most families could not afford. 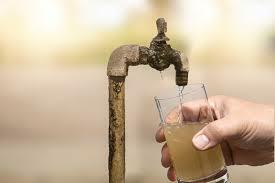 But unseen (and not smelled) was the lead breaking off from the corroding pipes –corrosion caused by untreated water. Dr. Mona was horrified to learn from her friend from high school, Elin Betanzo, that the water in Flint had become toxic. Lead, “…probably the most widely studied neurotoxin that humans have been using for thousands of years,” was present in exceptionally high parts per billion in the county’s water since the switchover. One piece of confirming evidence of the toxicity was General Motors’ gaining permission to switch back to Lake Huron water when it was found that Flint water corroded metal parts in the factory. Betanzo was attuned to issues of water quality; she had quit her job with the EPA when officials refused to address the dangers of Washington D.C.’s polluted water. Betanzo anticipated that the Michigan and federal governments would reject any evidence. She recommended calling in Dr. Marc Edwards, a Virginia Tech Civil Engineer; his research had led to reports of lead in D.C’s water, but was rejected by authorities. His study in Flint confirmed that the city had a severe problem; his findings were again disputed by officials, who presented their own (very unprofessional) studies. Dr. Mona’s focus then shifted to the potential victims who could be harmed the most—children through age 5. “Lead exposure has been linked to almost every kind of developmental and behavioral problem, including school dropout rates and criminality.” Lead “…impacts almost all systems of the body, the hematologic, cardiovascular, immunologic, and endocrine.” Seeing herself as both a detective and a renegade, the doctor gathered a group of pediatricians to combat the “environmental injustice,” in which the poor always lose. The fact that Flint’s population is 57% black, 37% white, and 7 % other, led her to infer that Flint may not have been viewed as being worth the state government’s efforts to pursue the truth and to remedy the obviously dangerous problem. To collect supporting evidence, Dr. Mona’s “team” collected blood tests, comparing lead levels in the young children before and after the switch of the waters source. The results were statistically significant, but the test group needed to be larger. Despite resistance from state agencies, Dr. Mona’s team was able to gather data from the entire county –with convincing results. However, the administrative pushback that had followed the D.C. water crisis reappeared: challenges to the numbers, accusations of falsifying evidence, and outright denial of responsibility. Frustrated, but not defeated, Dr. Mona took her evidence to both The Flint Journal’s investigative reporter, Ron Fonger, and The Detroit Free Press. The outcry was that it was not “just” the young children being affected; it was all of Flint. Denials and challenges kept coming—eventually the government’s argument seemed to boil down to another switchback’s being too costly. Flint wasn’t worth the expenditure. 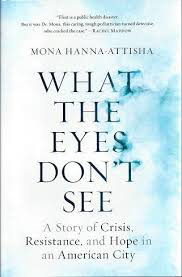 Dr. Mona Hanna-Attisha’s journey through this public health disaster is inspirational. If not for her courage and doggedness, the results could have become apocalyptic. Apparently recent reports indicate that the lead-in-water situation has not been resolved, but the evidence is in the open—unquestioned. Any reluctance or hesitation on the part of administrators would be criminal. Dr. Mona, the offspring of Iraqi immigrants, is definitely a dedicated professional and courageous American citizen. Ted Odenwald and his wife, Shirley have lived in Oakland for 48 years. 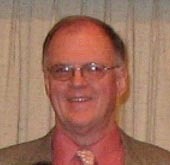 He taught HS English at Glen Rock High School for all of those years plus one more. Now he is enjoying time spent with his family, singing in the North Jersey Chorus and quenching his wanderlust. Ted is also the Worship Leader at the Ramapo Valley Baptist Church in Oakland.